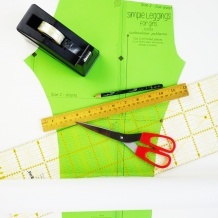 More times than not when sewing, you’ll have to cut your fabric out using a pattern. 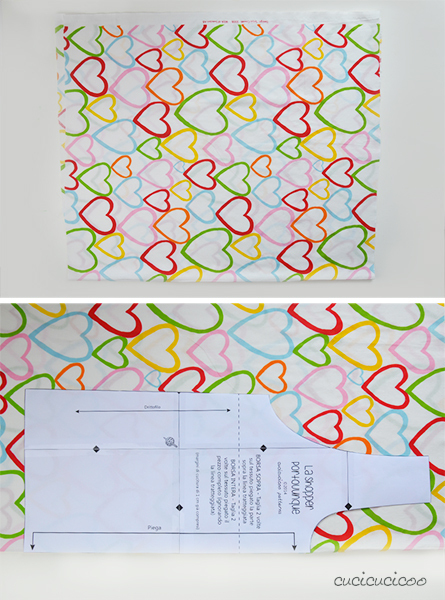 Whether your pattern is from a downloadable PDF pattern (this post describes how to print and assemble a PDF pattern) or a traditional large sheet of lightweight paper, there are a few basic rules to follow. 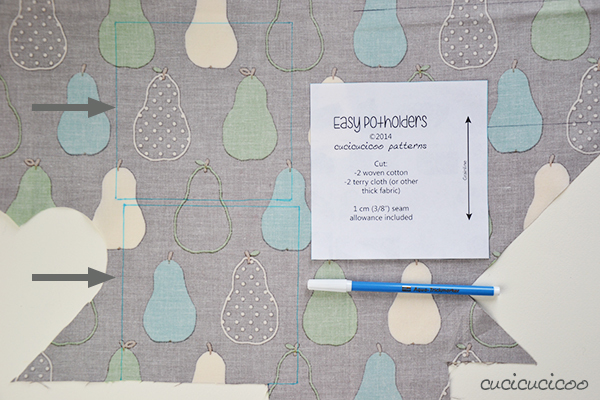 First get your paper pattern ready and then read on to find out how to cut fabric from a pattern! The first very important thing to do is to READ THE PATTERN INSTRUCTIONS!! Like I said numerous times in the lesson on preparing PDF patterns, every pattern is different and will tell you how many and which pattern pieces you need, how many of each to cut out of, which fabrics to use and whether or not to add seam allowance. This information is generally summarized on each pattern piece itself. From the pattern piece above (from my tutorial on easy potholders), you can see the pattern name, copyright information, how many pieces to cut out from the pattern, which fabric to use, the seam allowance (which is already included in the pattern), and the grainline. On patterns with more pieces, you will also see the name of each pattern piece. For example, I could’ve named this piece “circle,” but didn’t bother because it was pretty obvious that it’s the circle potholder, not the square or heart! What’s the grainline? Remember when I talked about grain in the fabric lesson? Grain is the direction that the threads are woven or knit in fabric. If you look closely at the fabric, you can see tiny rows (crosswise grain) and columns (lengthwise grain). 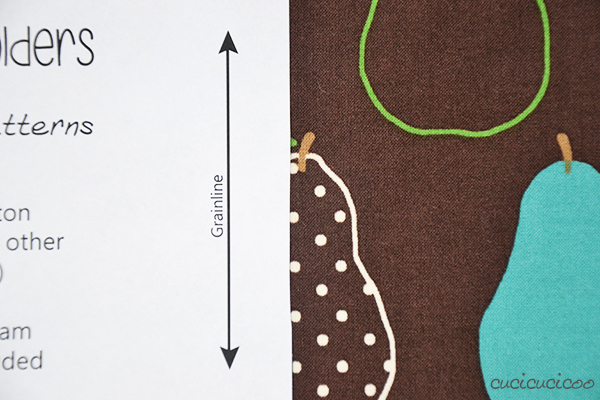 The grainline indicated on the pattern piece must run parallel to the lengthwise grain, as you can see in the photo above. 1. Hold the pattern down firmly (with your hand or pattern weights) and trace around it. In the picture above I used a regular pen because I knew that this was the inside fabric and wouldn’t be visible. When tracing on fabric that will be visible, make sure that you use a non-permanent marking tool (as discussed here). Then cut along the line. As you can see above, small pattern pieces are great because you can often cut them out from fabric scraps left over from other projects! This terry fabric was left over from sewing cloth pads. We can see from the pattern instructions for these potholders that we need to cut two of each shape from woven cotton and another two from terry cloth. The easiest way to cut two at a time is to fold the fabric in half along the grain, pin the pattern piece on top, and cut it out of both layers. Notice that in this photo I’ve positioned the pattern piece on the wrong side of the fabric. Normally you trace/cut a pattern on the right side, but in the case of perfectly symmetrical pieces, it doesn’t matter which side you cut from. 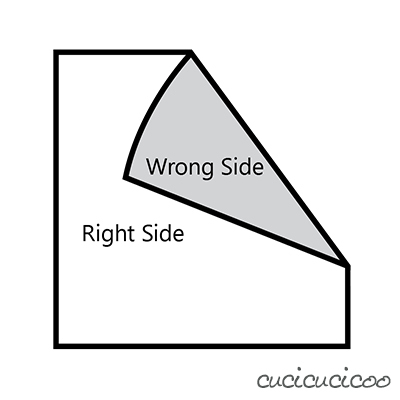 You could also position the pattern wrong side down, and it wouldn’t make a difference. In these cases, I prefer tracing/cutting on the wrong side of the fabric so that any markings I make will be hidden from sight in the finished product. When cutting pattern pieces out of upcycled fabric, make sure not to include any irregular fabric parts. In this example, I used a scrap of towel and was sure to avoid the folded-over towel edge. A technique that I only recently learned the name of (when sewing these fish toys) is fussy cutting. This is quite useful when using fabric with a print. 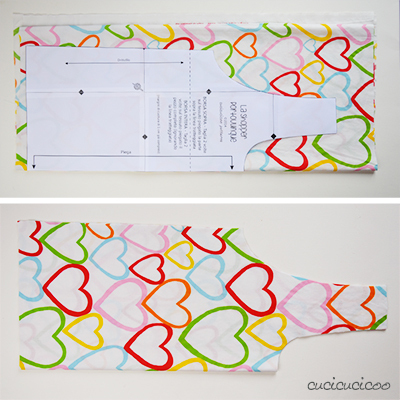 First, let’s see what happens when you cut a pattern from folded fabric with print. 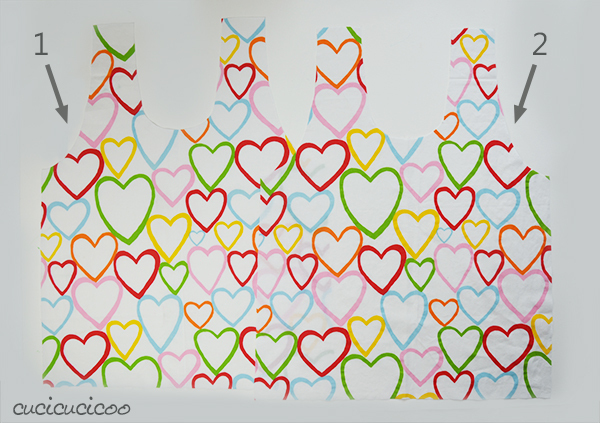 Above you can see that I’ve folded my fabric in half, traced the heart pattern on the wrong side and pinned it. 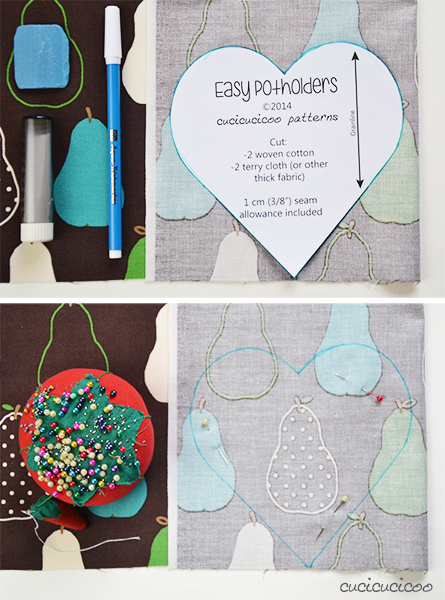 I was careful when positioning the pattern on the fabric so that there was a full pear right in the center of the shape. But what happens when I cut out both layers of fabric? The top layer has the pear right in the middle, but there isn’t a whole pear anywhere on bottom layer, which doesn’t look very nice. This is why we fussy cut, that is, position the pattern in a way that the fabric print looks good, even if it doesn’t make the most out of your fabric yardage. 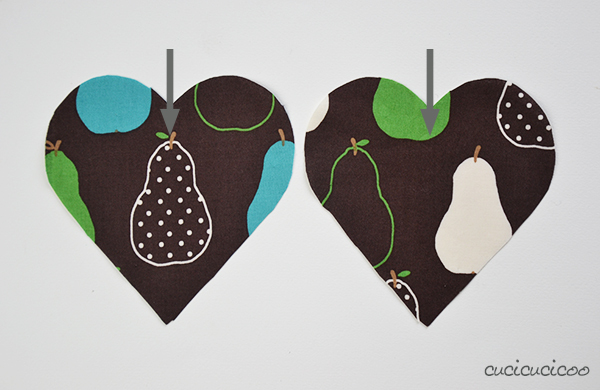 When cutting out my square potholder pieces, you can see that I positioned the squares so as to center two pears on each, rather than positioning the squares as close to each other and the edges as possible. In doing so, I was sure that my finished potholder would look nicer, even though I had to sacrifice a little extra fabric in order to do so. 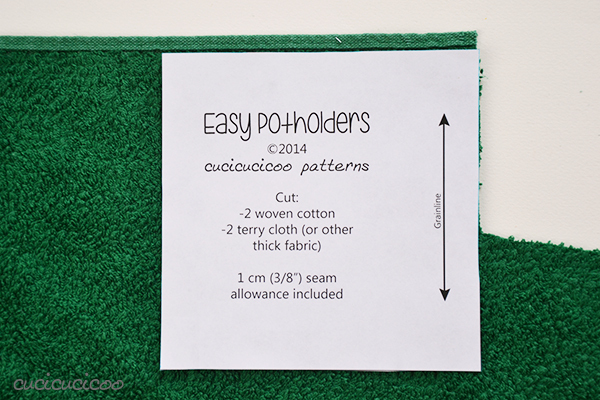 Potholders are pretty small and easy to deal with, but things change when you start sewing clothing or other larger items from patterns. The patterns for these items would be gargantuan, so when they are perfectly symmetrical, there is only half of the piece on the pattern with one side indicated as to be cut on the fold. 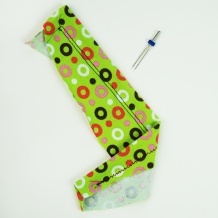 This is the case for my Carry Everywhere Shopping Bag (a FREE PATTERN for a shopper made from umbrella fabric! Go get it here!). To do this, you simply fold the fabric along the lengthwise grain and position the side marked as “on the fold” along the folded edge. When you cut out the piece and unfold it, you’ll have a perfectly symmetrical piece! 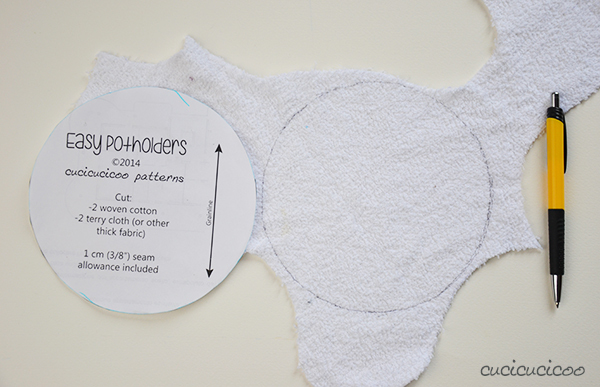 Often pattern instructions will include a cutting diagram, showing you the best way to fit the pattern pieces onto the fabric. The diagram above shows how to fold the fabric lengthwise and position the two pieces to be cut on the fold, then wedging in the last, smaller, piece. The diagram doesn’t show it, but the instructions actually say to fold the fabric in half twice, so as to have four layers, and to position the pieces along the double fold. But upon opening up the pieces, voilà! Two perfectly symmetrical pieces that are exactly the same! Just what we needed for our Shopping Bag! 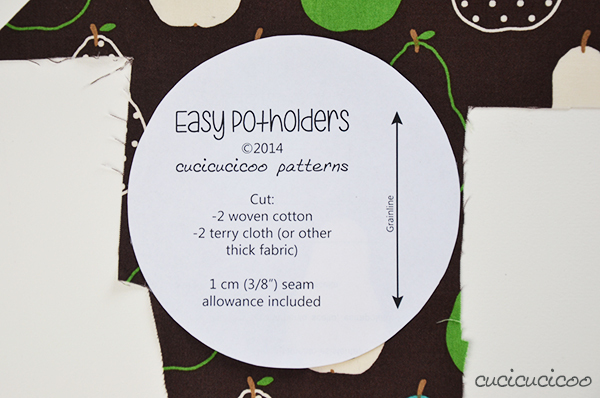 One last note that doesn’t actually have to do with cutting fabric out, but with following pattern instructions. We know that the right and wrong sides of fabric can be very different, so it’s important to always have the fabric positioned properly. 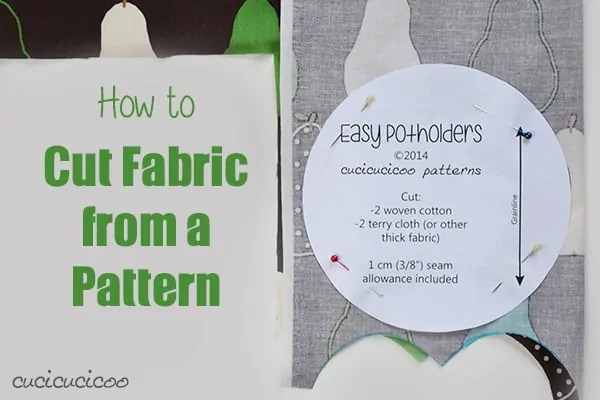 All pattern instructions with illustrated steps will have some sort of color key to show you how the fabric’s right and wrong sides are indicated. My pattern instructions generally show the right side as white and the wrong side as grey. So when you see the color grey in a step’s illustration, you know that it’s the wrong side, not the right side. Hooray! You’re now ready to start sewing from patterns! Just remember, as I’ve said before, always read the instructions, and you’re sure to make something wonderful! 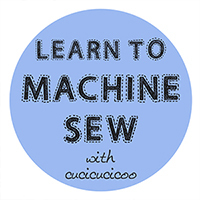 Do you want to start sewing from patterns right now? 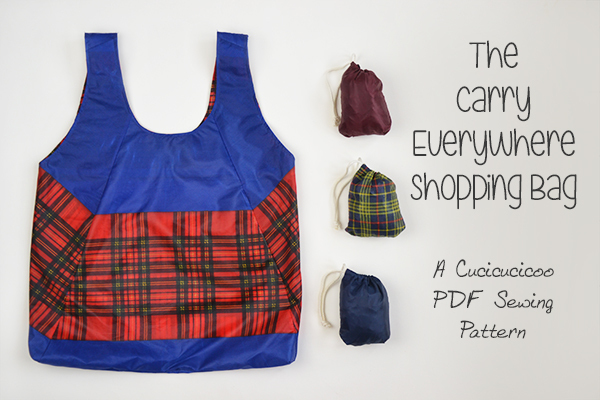 Well then, why not start with my free Carry Everywhere Shopping Bag pattern?! 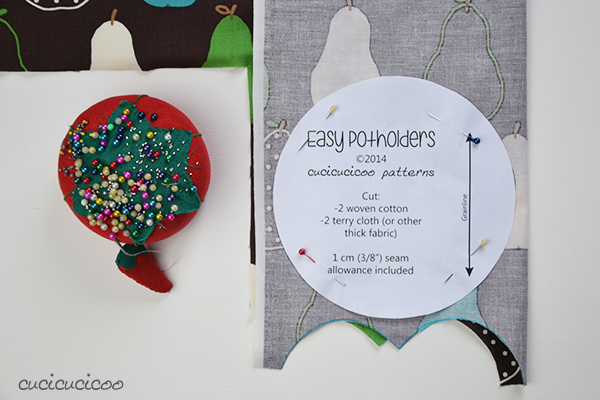 This lesson on how to cut fabric from a pattern is extra content of the beginner’s sewing course! Chiara e limpida come sempre!! archiviati i colli di pile (ne ho fato uno anche per me), mi sono messa a fare altre cose, soprattutto custodie per occhiali (odio quelle rigide e ingombranti che ti danno nei negozi), borse e altre cose per casa. Mi sembra di aver fatto progressi e ora riesco ad “immaginare” dei modelli semplici senza bisogno di seguire i tutorial passo per passo. Ma il problema più grande che ho è quello del taglio del tessuto: cartamodello o no, trovo difficilissimo allineare i pezzi tagliati e riuscire a farli delle stesse dimensioni. Mi spiego: io lavo prima il tessuto, poi lo stiro e poi procedo al taglio. Ma soprattutto quando si tratta di pezzi di stoffa piccoli (tipo i fat quarters) si storcono sempre un po’ lavandoli e stirandoli, anche se io li lavo in una “mesh bag” in modo da non farli sballottare troppo. A meno di non fare cose molto piccole, spesso mi ritrovo con un lembo di stoffa che mi esce da una parte, e se lo taglio rovino la fantasia e/o la simmetria perché non era tagliato più grande ma solo allungato da una parte durante il lavaggio o la stiratura. Non so se mi sono spiegata! Un altro problema del taglio sono gli angoli retti. Anche usando una squadra, se il bordo della stoffa non è regolare (o perché è stato tagliato male dal negozio – e succede spesso – o per i problemi di cui sopra) ho molta difficoltà ad assicurarmi che gli angoli siano a 90°. Pensi che un rotary cutter e una base di taglio potrebbero aiutarmi, o sono io che sbaglio qualcosa? P.S. Per il momento io sto usando soprattutto cotone fantasia tipo “quilting cotton”, che dovrebbe essere il più semplice da maneggiare, con la maglina e il pile dei colli sono proprio diventata matta perché oltretutto non stavano fermi! Ciao Cri, sei una macchina! Stai cucendo un sacco di cose, complimenti! Sì, quello che dici succede anche a me. 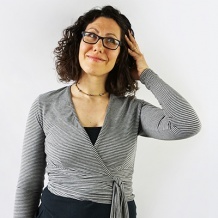 Trovo che la stoffa si storce di più quando si stende per asciugarla all’aria, ma non so che cosa consigliarti, onestamente. Praticamente si fa un taglietto su un bordo e si strappa fino all’altro bordo. In questo modo si ottiene un taglio perfettamente lungo la trama. Oppure puoi fare il taglietto, individuare un solo filo del tessuto e delicatamente tirarlo fuori del resto del tessuto, lasciando una linea più vuota da cui partire. Questo secondo metodo sarà più preciso e non spreca tessuto, ma lo trovo un po’ noioso! Se tagli molti pezzi rettangolari, ti consiglio assolutamente la base di taglio e la rotary cutter, che sono comodissimi da usare. Io li uso spesso e infatti avevo pensato di farci un post, dimostrano come usarli. Grazie, grazie! Si, mi dimentico sempre che la stoffa si può strappare lungo la trama, anche se, come dici tu, se ne spreca un po’. Proverò anche a sfilare un filo, anche se non sono tanto portata per i lavori di precisione ;-). Per quanto riguarda il lavaggio (e l’asciugatura), io non ho l’asciugatrice, quindi posso solo asciugare all’aria. Forse mettendo la stoffa orizzontale si deforma meno? Proverò. E penserò anche alla base di taglio e al cutter, magari aspetto il tuo post! Neanch’io ho l’asciugatrice. Forse sì, se si stende in piano, andrebbe sicuramente meglio, ma non ho proprio lo spazio in casa per farlo con pezzi grandi di tessuto!